There are probably as many recipes for pulled pork in the slow cooker as there are celebrities who give their babies weird, made-up names. So before you dismiss this as yet another pulled pork slow cooker recipe, let me tell why this one is great. So great that it's pretty much perfect in my book. For one, it tastes like meat. Many recipes I've made taste like the sauce I poured all over it when I threw it in the slow cooker. Saucy meat has its place, but sometimes I want to taste more of the meat that I'm cooking than just warmed sauce. Two: It isn't floating in fatty goo. If you've cooked in a slow cooker before you probably know what I'm talking about. I'm always at a loss for what to do with this goo when I'm done cooking. Stir it up and pretend I didn't see all that oil floating around in it? Strain it into my fat separator? I like that in this recipe the pork is cooked, pulled out of the cooking liquid, shredded, and tossed with a light sauce. Problem solved. Three: It's easy. No need to elaborate here. Four: It's mostly from scratch. I love the control over what I put in it. Five: Did I mention it was moist and delicious? It has a subtle kick, a little tartness, and an overall flavor that pleased the picky eaters I served it to. Six: Lime ginger mayo. It's optional, but I suggest you try it. Just. plain. awesome. 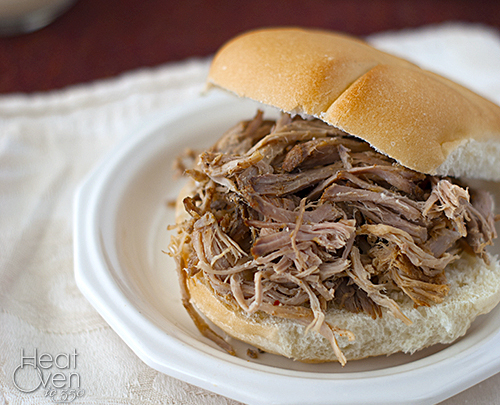 Even if you have a few slow cooker pulled pork recipes kicking around your recipe binder, give this one a try. You won't be disappointed. Layer the onions in the bottom of a 5-6 quart slow cooker. In a small bowl, combine the brown sugar, paprika, salt and pepper; mix thoroughly. Rub the mixture all over the roast and place the roast on top of the onions in the slow cooker. In a medium bowl, combine the vinegar, Worcestershire, crushed red pepper flakes, sugar, mustard powder, garlic salt and cayenne pepper; stir to combine. Drizzle about 1/2 of the vinegar mixture over the roast. Cover and refrigerate the remaining mixture. Cover the slow cooker and cook on low for 10-12 hours. Remove the meat and onions from the cooker, drain and place in a serving bowl. Shred the meat. Mix the remaining vinegar mixture into the shredded meat. Season to taste with kosher salt. Combined all ingredients for lime ginger mayo in a small bowl. 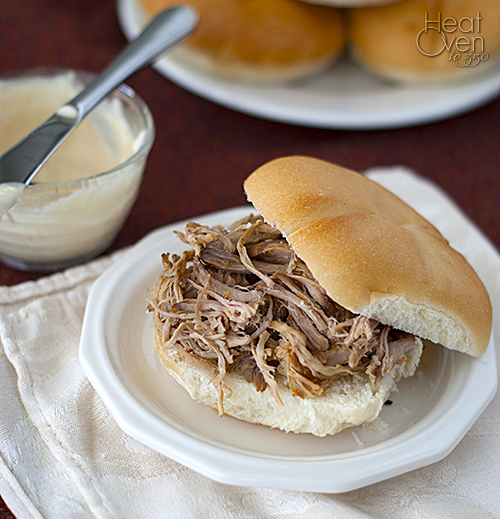 Serve pork on crusty rolls with lime-ginger mayo. My grandpa was from East North Carolina, home of the vinegar bbq! I make a crock pot version similar to yours - and when I first made it for my husband he asked where the bbq sauce was - doh! I need to make this soon! Hope you are doing well Nicole! That's funny with your husband - it is very different if you expecting a "sauce". It's so light tasting in comparison. I had never tried a recipe like it before and I'm glad to know some of its origins! Love the pulled pork, but the lime-ginger mayo is really calling my name! Looks so scrumptious, Nicole!